Spiral Castellations: the Newgrange megalithic passage tomb at Brú na Bóinne, County Meath, Ireland. One of the most enjoyable, suspenseful passages in Howl’s Moving Castle, both book and anime, is Sophie’s arrival at the Moving Castle, or rather the Moving Castle’s arrival at Sophie. According to Jones’s epigraph to the novel, the title was suggested by a student who wanted her to write a story called The Moving Castle. How long it took the story and its castle to incubate after her subconscious “primordial sludge” went to work on the title I do not know; she may have written about it somewhere. I can make a good guess that Castle’s nearest nearest literary antecedent may be the mythical fortress Caer Sidi, to which Robert Graves devotes an entire chapter, “A Visit To Spiral Castle,” of The White Goddess. Newgrange, pictured above, is an example of the ancient British castle of death. Tower-like, it is about 50 feet tall and sits on what looks from aerial photos like the highest ground in the district. And it can be said to revolve, not in the sense of spinning like a top, but over the stately course of an astronomical year: at the winter solstice the rising sun, shining through an opening over the entrance, illuminates the entire passage within for as long as 17 minutes. 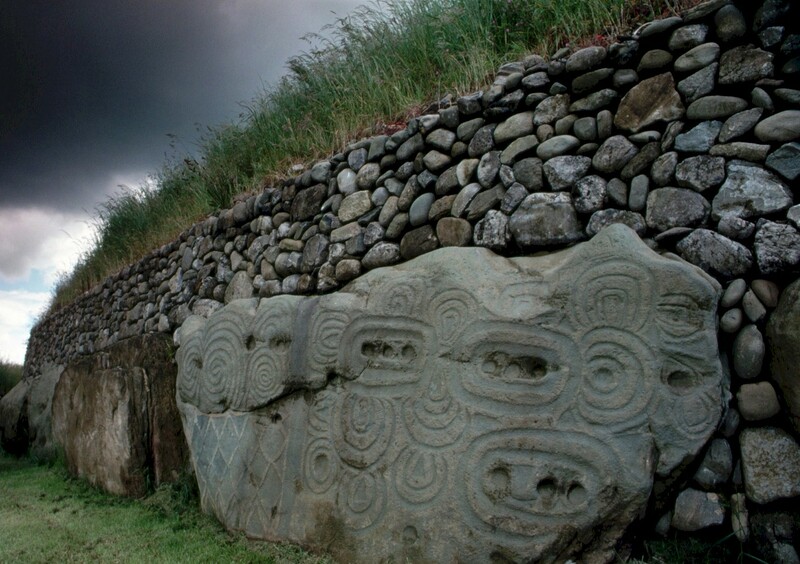 The ancient spiral design, long associated with the Celts (although Newgrange predates the arrival of that culture), can be seen on the large “kerbstones” that surround the monument, and the restored facing of white quartz calls to mind “princess on the glass hill” stories. This ancient earthwork would seem to have entered our collective imagination, or else it takes its design from the same parts of that imagination. The point is, though Howl’s castle doesn’t look like Newgrange, there is a definite vibe of fear and death emanating from it, a coldness. But Sophie, or so it seems, doesn’t even fear death at this point. Certainly not deathliness. She just wants to get in out of the cold. So when that dark door opens, what is she going to find? As you might expect, not what you might expect.